Nash Aguas finally confirmed that a teleserye is in the works for him and the rising tandem of Elmo Magalona and Janella Salvador. Reports about this teleserye started after Dreamscape head Deo Endrinal posted a photo of the three stars on Instagram some two weeks ago. “Siguro nabalitaan niyo na kasi nag-post si Sir Deo. Abangan niyo ‘yun kasi kakaiba ang teleseryeng ‘yun,” Nash said in an interview at the Converse Philippines Face Off OOTD Fashion Event. According to the teen star, he was “blown away” when the soap was presented to them. “Nung prinesent sa amin ang story maski ako nagulat. Mas pang-international ang plot ng story,” he explained. Would he have a partner on this soap or will he be a third wheel? “‘Yun ‘yung exciting na part kasi usually di ba may ka-partner ako? So actually hindi rin naman ako third wheel pero kailangan niyong abangan kung ano ang mangyayari,” he said. 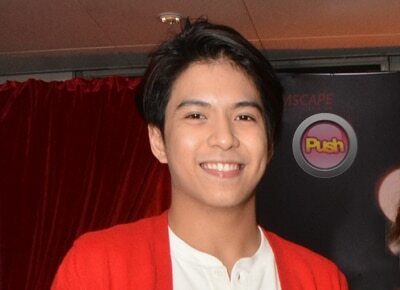 It may be recalled the Nash’s last soap was Doble Kara where he was the love interest of Alexa Ilacad’s character. Reports have it that Nash and ElNella’s soap will air this year.